Viewing 24 of 385 items. A Stationery Studio Exclusive! 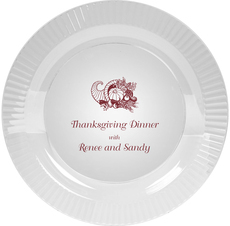 Make your Thanksgiving table extra special with personalized placemats. These beautiful personalized placemats are available as individual laminated placemats or as a.. The Anthony Empire Arch Tower pad will last and last. This huge pad has 500 sheets! Pad measures 6" x 6". Features your family's name and up to 10 names or phrases. Imprint in your..
A Stationery Studio Exclusive! 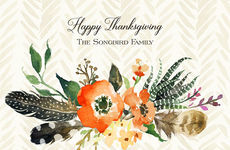 Your Thanksgiving table will be complete with these beautiful personalized placemats. These beautiful placemats are available as individual laminated placemats or as a..
A Stationery Studio exclusive! 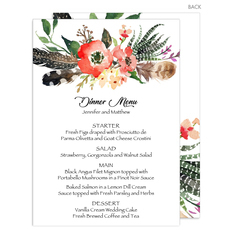 This set of beautiful feather and floral designed menu cards is perfect for your next event. Back of cards are fully designed. Size of cards is 5" x 7". 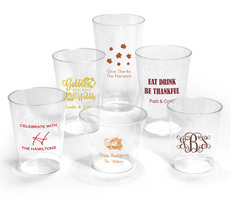 Flat..
Personalized disposable clear hard plastic cups are ideal for your Thanksgiving or fall celebration. Your choice of imprint color and personalization style. Many cup sizes available. Positioning only..
Set of guest towels with your choice of guest towel color and imprint color. Quality 3-ply thickness. Approximate size 4.5" x 8". Typestyle and positioning only as shown. 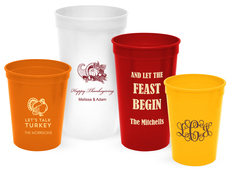 Guest Towels are shrink..
Personalized white foam cups are ideal for your Thanksgiving or fall celebration. Many fall themed designs to select from plus monograms and more. 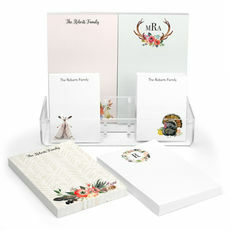 Your choice of imprint color and personalization..
A Stationery Studio Exclusive! 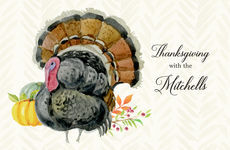 Your Thanksgiving table will be extra special with these beautiful personalized placemats. These personalized placemats are available as individual laminated placemats..
Personalized mini twisted handled bags are perfect for small gifts or favors for your Thanksgiving guests. 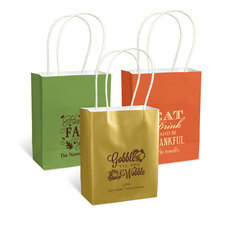 Personalize the bags with your monogram or initials, a fall design and/or the text of your..
A must-have for your upcoming fall themed or Thanksgiving weekend celebration. 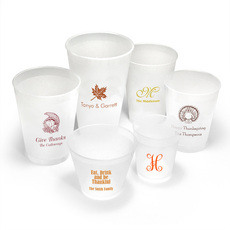 These disposable or reusable personalized stadium cups are ready for your favorite cold beverages. Your choice of cup.. These invitations feature a printed invitation inserted into a die-cut side pocket embellished with pre-tied ombre ribbon. Invitations measure 7.75" x 5.25". 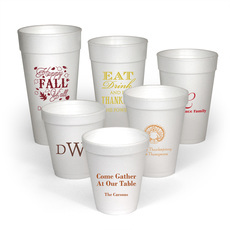 Invitations, envelopes, diecut..
Personalized disposable or reusable shatterproof frosted cups are ideal for your Thanksgiving or fall celebration. Your choice of imprint color and typestyle. Many cup sizes available. Positioning of..